The Ionian Island of Lefkada (Lefkas) is the only island within the Ionian Archipelago that is directly connected with the mainland and therefore a favourite with the local Greeks. The Capital of the Greek island is situated in the extreme north and greets all arriving visitors who have to pass it on their way. Directly outside Lefkada (Lefkas) is Agios Iannis Beach, a regular highlight as beaches go. The natural beach extends over several kilometres and due to favourable wind conditions, it is very popular with kite surfers. Until recently tourism has not been encouraged on the island of Lefkada, as the family of the Greek shipowner Aristotle Onassis owns the small island of Skorpios directly off the mainland coast. He and his family valued their privacy, so heavy lobbying went on in order to prevent the development of a tourist infrastructure and, in particular, stop an airport from being built on Lefkada. In view of these efforts, it is ironic that the island’s tourist centre in Nidri is now directly opposite the island of the Onassis family. When the family are staying on Skorpios, their private island has a number of patrol boats guarding it and making sure that it cannot be invaded by tourists from Lefkada (Lefkas). The island of Lefkada (Lefkas) has a number of beautiful beaches and bays, many of which can only be accessed by boat. The best beaches are situated on the west coast of the Ionian Island, where the sea is much choppier; Porto Katsiki, Egremmi and Kathisma are all easily accessible by car. As Kathisma is the most convenient beach to get to, it has the largest number of deckchairs for hire and there are bars as well. This is just the place for holiday makers who like crowded and noisy beaches where you can show off your swimwear and appraise that of others, and meet people in large beach bars. Anybody else will not like it there and is better off looking for somewhere quieter. Other popular holiday resorts on the Ionian island of Lefkada (Lefkas) include Agios Nikitas, Vasiliki, Nidri, Nikiana and romantic Sivota (a real insider tip). 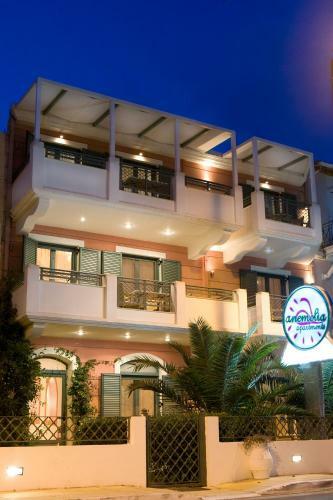 Agios Nikitas is one of the most popular holiday resorts on the Greek Island of Lefkada (Lefkas). Like most islands in the Ionian Archipelago, Lefkada is beautifully lush and green. The best parts of the island, however, are its lovely and very long sandy beaches. Agios Nikitas doesn’t have a harbour, but the boats just anchor here and make a beautiful picture. The small car-free main road leads from the village down to the beach. Agios Nikitas is not a big resort, but offers sufficient evening entertainment even for a longer stay. Some of the beautiful villas and apartments in the village are rented out privately. Nidri is the tourist centre of the Greek Island of Lefkada. The village is situated on the east coast of Lefkada and, with its offshore islands, makes a lovely picture. 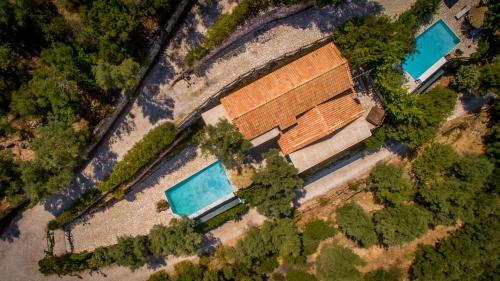 The tiny island of Skorpio is something special, as it belongs to the Onassis family who tried to prevent Lefkada from developing a tourist infra-structure in order to protect their privacy. Nevertheless there have been tourists flocking to Nidri as part of British and Scandinavian package holidays, and there is a large choice of evening entertainment as well as excursions to other Ionian Islands such as Ithaca, Meganisi and Kefalonia. The romantic little harbour town of Sivota in the south of the Ionian Island of Lefkada is something like a well-kept secret for a holiday on Lefkada. The sheltered bay is very popular with yachtsmen which is why during the summer months a lot of sailing boats anchor here and give the location a cosmopolitan feel. Sivota has no through road, and in the evening there are lots of tables set out directly by the harbour. Sivota has a relaxed and romantic atmosphere in the evening and inspires those who experience it to come back.